Parks and Recreation returned last week after a lengthy hiatus, and it was good to have the old gang back. I wasn’t sure about the show at first, but it really grew on me in season two. Aziz Ansari is great, Andy is such a charming half-wit, and the introduction of Rob Lowe and Adam Scott have kicked the whole ensemble cast thing up a notch. Of course, the best reason to watch Parks and Rec is Ron Swanson. He is, in short, perfect. 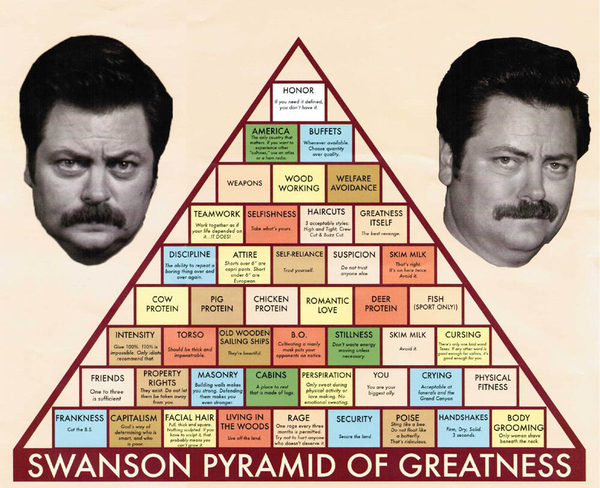 Don’t take my word for it, though – just check out the Swanson Pyramid of Greatness. I know I’ll be dedicating the next 12 months of my life completing each of the 45 steps.